When we look at the modern FPS we think of Call of Duty, Battlefield & Halo as your big AAA shooters. Often we question the evolution of these games and how little progress is made each year. It wasn't always like that. 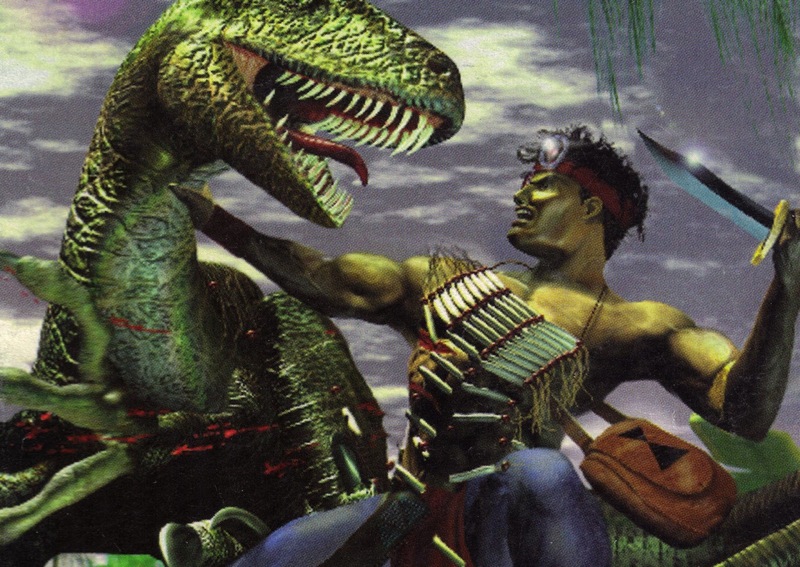 Turok: Dinosaur Hunter was once a big gun in the genre, and it did move things leaps and bounds forwards. For an example of a retro shooter that has been updated for modern gameplay standards, check out Matt's review of the Shadow Warrior reboot. Turok: Dinosaur Hunter is the PC re-release of the 1997 N64 game. After selling 1.5 million copies upon initial release (which was a lot for 1997), it grew into a popular franchise that has had a total of six games released - the latest being in 2008. While my little experience of Turok was me sitting on the couch and watching my older friends play the game I always thought it was a pretty cool idea, but never playing the game myself, I didn’t know what to expect. It's a genre that doesn't age well (just try playing Goldeneye now), but this one holds up relatively well all these years later. With games like Perfect Dark & Goldeneye yet to be released on the N64, Turok was the best first person shooter game on the console at the time of its release. While it was often referred to as a “Doom clone,” it was actually the first game to really move away from corridor environments and offer a more open area, exploration-based shooter. It also had its own pop up map, which you would really need to use to avoid getting lost. Back in its day it was also one of the first games to use the N64’s control stick as an aiming device, relegating movement to other buttons. While clunky in execution (the shooter genre was not at home on the N64), analogue control of aiming did represent a big evolution in control mechanics that has now been adopted by default in all games. And with the PC port of the game you get to enjoy mouse-and-keyboard controls, which makes this version of the game the definitive one by default. Turok has very little narrative, as was typical of the genre back in the day. 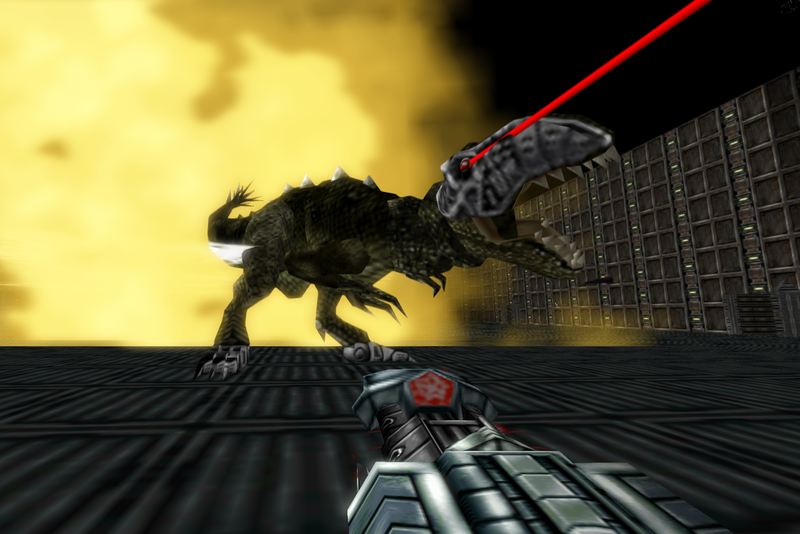 You play as a Native American Warrior, the “Turok,” and your mission is to defend the world from a deadly weapon. Simple as it was, the setup had atmospheric impact when it dumped you in the middle of a mountainous jungle. The tribal drums and sounds of dinosaurs roaring boom through the ears and instantly pull you into the thick of the action. Turk also made good use of a number of visual effects that other games at the time did not. The surrounding fog was a way of hiding the extreme level of popup that the game would have otherwise laboured on players, but it was effective in both hiding enemies and setting the mood. On the other hand, it also features elements that have thankfully been all but purged from the genre. There is so much platforming involved, for example, which, with few exceptions, has never been something the FPS genre has done well. You collect a series of weapons, including the typically over-the-top stuff from the genre at the time, such as the nuke gun (that basically nukes everything and somehow you manage to survive). There's also a whole bunch of key collecting that you'll need to do - another throwback to the heady early days of the genre that has thankfully been done away with by now. Progressing through each level doesn’t simply unlock the next, you'll need to find all the keys scattered across multiple levels, so you really need to be aware of your surroundings to make sure you aren’t simply replaying each level again and again. This is a really good way of punishing players who don’t explore the landscapes and can be rewarding for players who take their time. Or it can be simply frustrating, depending on where you sit. 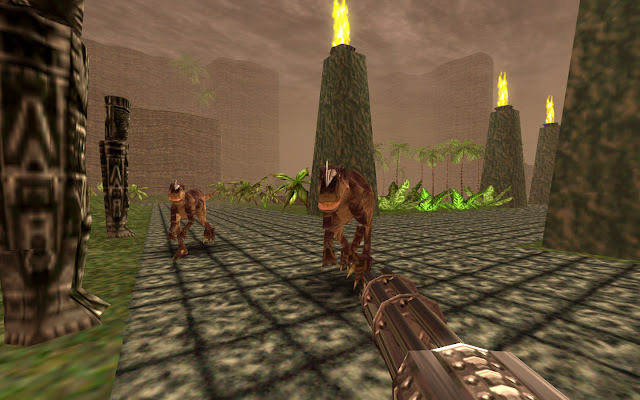 In Turok you will also find yourself coming across a couple of mini boss fights in each level, with stronger boss fights to come later on in the game. These enemies are stronger than your normal goons and they also carry some stronger weapons. You would do well to get out of a boss fight with more than half your health remaining. The way the enemies evolve through the game is another one of the things that I liked. Your enemies start off with spears, then moving to guns, before you can find them riding dinosaurs, robots and even aliens later on in the game. While there is only eight levels in this game, the variety that it offers throughout is impressive. The amount of detail packed into each level, with its own specific scenery is where Turok really stood out from similar games in its time. Related reading: Another classic FPS available on modern consoles is Duke Nukem 3D. This game will never die. Matt's full review. Sometimes you can wonder to yourself, “How on earth did they come up with this stuff?” and to the modern developer the type of unrealistic setting this game has to offer might not be the way to go. We need to remember that games are games, they don’t have to be realistic, and the pure escapism that Turok offered all those years ago is, you have to feel, something of a dying art. It’s fast paced arcade shooter style is a ton of fun, and considering the types of leaps and bounds it brought to the FPS genre, it’s no wonder that it managed to succeed all those years ago.